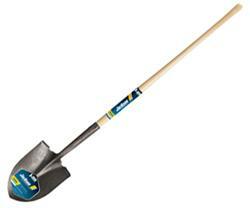 Kodiak round point shovel has an extended blade socket that provides more stell for greater strength. 48 In. L seal-coated premium northern ask handle for strength and durability. Our best tools yet! Made to work extra hard! Crafted with only premium materials and packed with features that guarantee them to last, even under the most stringent conditions.